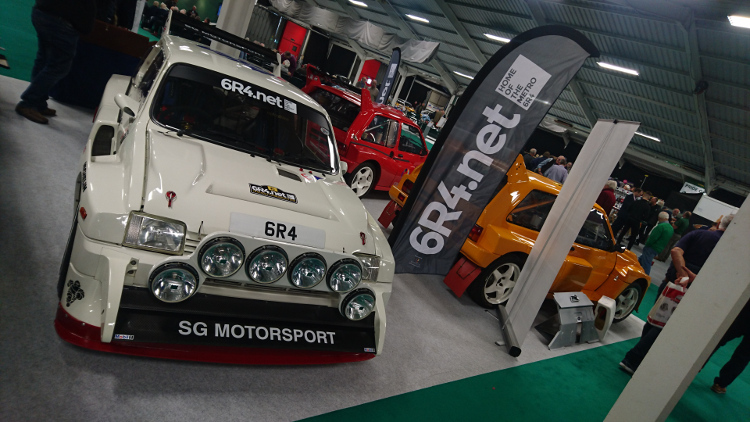 6R4.net will be celebrating the 35th Anniversary of the Original Launch of the iconic MG Metro 6R4 at the forthcoming 2019 Race Retro - the anniversary of which takes place during the actual show, to the day! 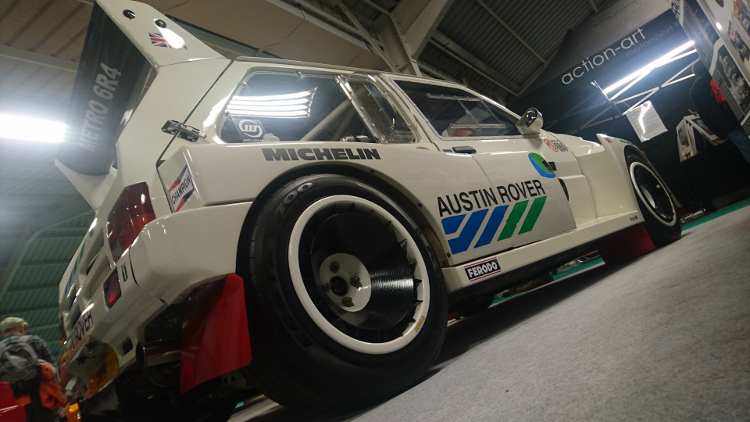 The three-day International Historic Motorsport Show runs from Friday 22 to Sunday 24 February at Stoneleigh Park, Coventry CV8 2LG, and 6R4.net would like to invite you to experience the display, and share your memories of this highly respected Group B 'supercar'. As 'The Home of the Metro 6R4', 6R4.net have organised a multi-car stand which not only showcases an impressive cross-section of striking examples, but is also supported by one of the most comprehensive scale model and memorabilia collections seen in public, and a merchandise shop where you will be able to purchase items, and proudly display your support for the car. 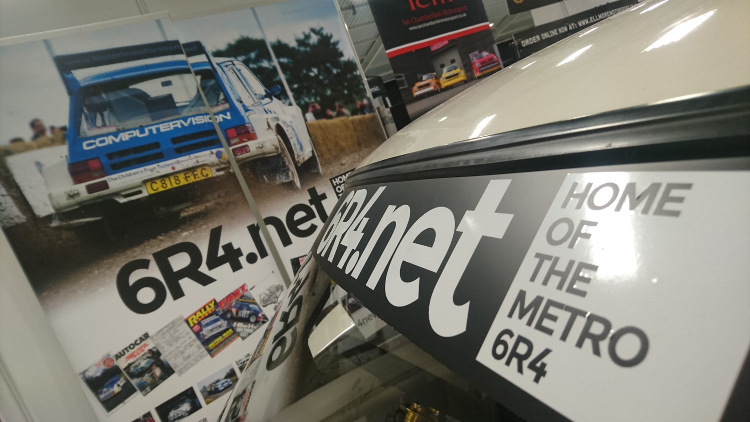 Occupying Stand 3-442 within the 'Motor Sport Hall of Fame Live' in Hall 3, and amongst other displays celebrating some equally fantastic milestones in motorsport history, 6R4.net welcome you to join us in celebrating this historically significant anniversary. Dave and myself would be very pleased to meet you on the stand for a catch up, if any of you intend going? Well done the 6R4 team in keeping a model display going at Race Retro. See you at Rally Day!!! As ever, I love looking at photos of other collections and how they are displayed and presented. Excellent work by all concerned. It looks to be a great display. Is this 128 unique liveries, or were some duplicates? Also, was there ever a finer looking wheel setup than the 6R4 rims with wheel fans? The model display was superb. There were plenty of 6R4's of Irish interest included - the Breen / Nagle one from the Killarney Historic must have been "hot off the presses" as they say! Well done to all concerned! Bobby. CDM wrote: Well done the 6R4 team in keeping a model display going at Race Retro. 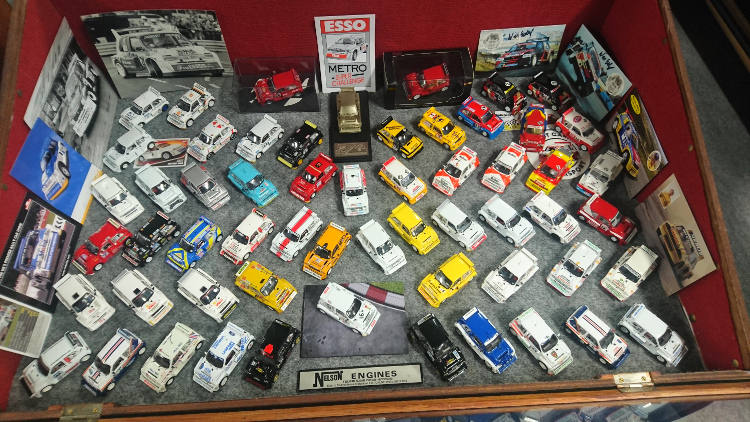 More than most, you know exactly what it's like organising a display at Race Retro. We only heard that we'd secured the space about 6-8 weeks before the show, so to then manage to secure three very different cars for the display - one 2.5L latest rally spec, one 3L Jaguar Duratec engined and sequential gearbox spec, and one never rallied 3L International spec car - was impressive, to say the least. There were 82 of my models on display on the Friday, and they were joined for the last two days of the show by a selection of Dave's models, which (plus a couple of other randoms) took the total tally to 128! 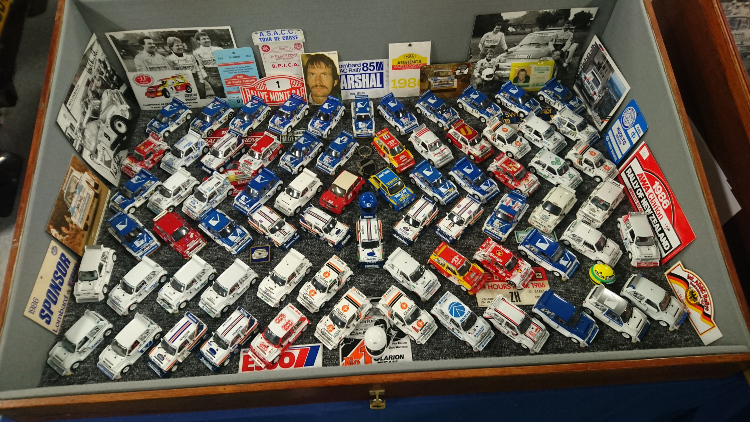 They were separated into two themed cabinets - one covering 1984-1987 prototype, WRC, BRC, European events, etc, and a second covering rallycross, and the more modern subjects. I admit, one of the cabinetrs really was packed to the rafters, however I wanted to include as many as possible, rather than leaving a few behind, or tucked under the table. 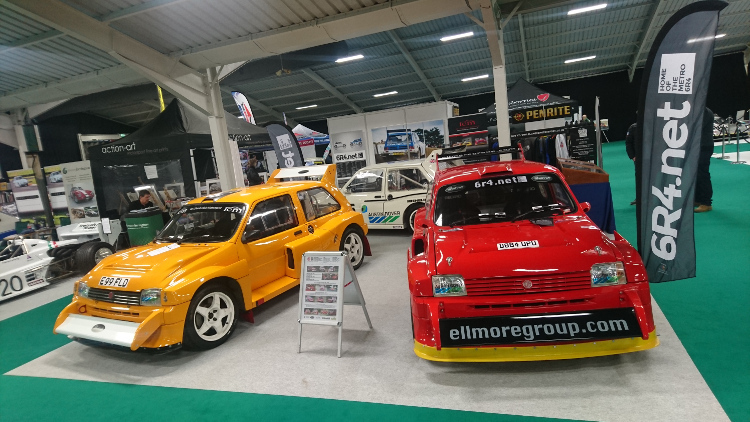 Both displays were supported by various items of related Metro 6R4 memorabilia - just like our learned CD has done with his numerous and always impressive displays over the years! JOB wrote: As ever, I love looking at photos of other collections and how they are displayed and presented. Excellent work by all concerned. Many thanks, JOB - like CD, you too know exactly what is entailed putting together a display such as this, so it means even more reading such kind comments from someone like yourself. Thank you. David Napier wrote: It looks to be a great display. Is this 128 unique liveries, or were some duplicates? The display featured 128 unique liveries, David. Admittedly, some of them were 'mass produced' releases from the likes of Skid, IXO, etc, however in certain examples we had created the associated second entry from the event, ie the Tony Pond's 'Skid' 1985 RAC release was supported by a Code 3 of Malcolm Wilson's entry from the same event, and likewise with Tony's 'IXO' 1986 Monte Carlo Rallye entry. 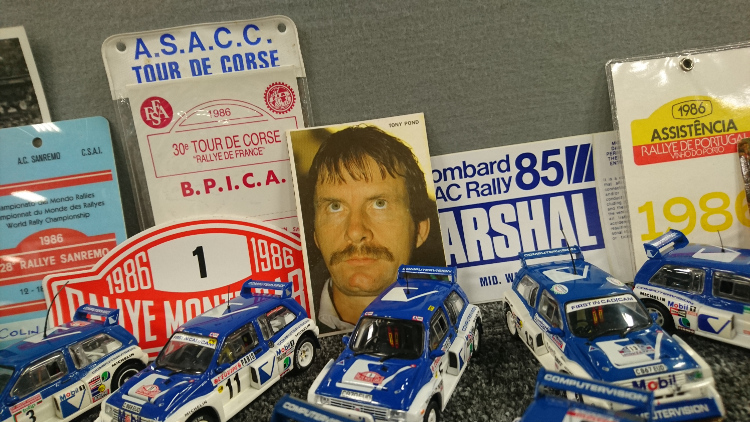 They were also joined by personal Code 3 one-offs of all three 1986 Sanremo entries, all three 1986 Portugal Rally entries etc. David Napier wrote: Also, was there ever a finer looking wheel setup than the 6R4 rims with wheel fans? To answer that question honestly, NO never! The carbon fibre wheelfans on big tarmac 16" Dymag wheels surely is the sweetest combination ever! bobby clinton wrote: The model display was superb. There were plenty of 6R4's of Irish interest included - the Breen / Nagle one from the Killarney Historic must have been "hot off the presses" as they say! Well done to all concerned! Bobby. Thank you, Bobby - great to meet you again, and so nice to hear that all our efforts were appreciated on the day. Thank you also for noticing the Breen / Nagle 2018 KIllarney Historic Rally entry - more of which shortly when I have sorted my wheel supply issue, and adjusted the decal artwork in a couple of places.